The Skinny: Samsung remains unfazed by Sony's bailout of the rear-screen projector market, showing its Series 6 and Series 7 at CES 2008. The claim to fame of these big berthas? Huge screens for little moolaa, although Sammy isn't saying how much they will cost. The Series 6 will have a relatively slim cabinet for a rear-screener, and screen size choices in 50, 56, 61 and 72 inches (HL50A650, HL56A650, HL61A650). The 61-inch 67-inch Series 7 sets (Model numbers HL61A750 and HL67A750) use Samsung's LED DLP tech, and rocks a new version of its Cinema Pure color engine and power-saving Energy Star compliance. Both are available this spring. The Catch: Old tech, dying everywhere. Another pic and the press release, after the jump. LAS VEGAS, January 6, 2008 - Expanding on last year's introduction of the world's first 3D-ready DLP HDTVs, Samsung Electronics continues its commitment to offering consumers choice, value, leading product designs and innovation within the DLP HDTV category by announcing its 2008 ―Series 6 and 7‖ line-up today. With a strategic focus on product performance and design, cost of ownership and energy efficiency, Samsung enters 2008 with excitement and vigor in regards to the company's leading position in the DLP category. The new Series 6 and Series 7 DLP HDTVs offer consumers increased value while integrating innovative features that lead Samsung's portfolio of Micro Display and Flat Panel HDTV offerings for 2008. The Series 6 and 7 DLP HDTVs not only feature larger screens and Full HD 1080p clarity for sports, movies and gaming, they also offer the latest in networking and 3D technologies. Samsung's DLP HDTV lineup will be on display at Booth #11033 during the International Consumer Electronics Show held at the Las Vegas Convention Center, January 7 through 10. Samsung is steadfastly committed to remaining a leader in the DLP space in 2008 and beyond with a strong investment in product development fueling the consistent introduction of innovative and affordable DLP HDTVs,‖ said Steve Panosian, director of Visual Display Marketing at Samsung Electronics America. Building on the success of our innovative technology, we've incorporated several new upgrades, such as WiseLink 2.0 (USB) and HDMI V1.3 for enhanced connectivity, allowing consumers to access a wide range of content through their TVs. In addition, DLP has been proven to be an energy efficient HDTV category, and Samsung continues to focus on making DLP the most energy efficient possible. Consumers will also enjoy a total 3-D experience, with the finest in sound and picture resolution,‖ added Panosian. The 2008 6 and 7 series DLP TV will feature built-in 3-D technology and entertainment modes that automatically optimize both audio and video quality to deliver the best movie, sports, and gaming experience possible. The new remote design includes dedicated ―Entertainment Mode‖ buttons making split-second adjustments possible. Samsung's 3D-technology co-marketing plans include a starter kit accessory acclimating even novice users to this unique application. Samsung's Series 7 DLP HDTV has one of the most environmentally conscious designs on the market today. Consumers will find that this series' new Cinema Pure™ Color Engine powered by the long-lasting Generation 2.4 LED consistently outperforms its traditional lamp-based counterparts, delivering outstanding picture quality and continuous light output rated at over 60,000 hours. Greener HDTV — energy consumption and cost of ownership message to the consumer. Adding to the functionality of our Series 7 DLP TVs is Simplay HDMI compliance, a new Remote with specially designed hot keys, and a new simplified user interface and menu system. The result of these enhancements enables control over all HDMI-CEC-compatible A/V devices for a simplified total system convenience experience. WiseLink 2.0 (USB) with codec support for MP3 and JPEG enables consumers to easily access files from their portable media and display the files on a brilliant big screen HDTV. The Series 7 DLP TVs will also feature a 1 Tuner PIP function. The Series 7 LED DLP HDTVs will be available in April and June in both 61-inches and 67-inches (Model numbers HL61A750 and HL67A750). About Samsung Electronics America, Inc. Headquartered in Ridgefield Park, NJ, Samsung Electronics America, Inc. (SEA), a wholly owned subsidiary of Samsung Electronics Co., Ltd., markets a broad range of award-winning, advanced digital consumer electronics and home appliance products, including HDTVs, home theater systems, MP3 players, refrigerators and laundry machines. 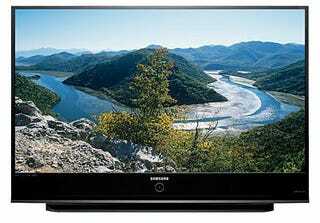 A recognized innovation leader in consumer electronics design and technology, Samsung is the HDTV market leader in the U.S. and is the only manufacturer that produces all four major digital television technologies. Please visit www.samsung.com for more information.